About 10 years ago beekeepers began to report unusually high losses of 30-90 percent of their hives. Worker bees would suddenly leave the hive, leaving the queen and the young behind, and without the workers the rest of the hive would eventually die. The phenomenon was called Colony Collapse Disorder and it became a very troubling issue across the United States. You see, honey bees are the world’s most important species of pollinator. Here at Maisie Jane’s we’re especially aware of that because almond trees need cross-pollination and we depend on healthy bees to make that happen! Every year in February and March the almond trees burst into bloom. We bring hives into the orchards and the bees fly from tree to tree. Almonds are generally the first trees to bloom so bees enjoy foraging for their first taste of pollen and nectar for the year. In return they pollinate the blossoms for us along the way. Every flower must be fertilized to grow into an almond. When they’re finished the hives are brought to other locations to pollinate other crops and produce honey. So when we learned that the honey bees were in danger, we and many other almond growers in conjunction with other food crop producers and beekeepers sprang into action to save them! This is an ongoing project but it now seems that the efforts have reaped many rewards. The bee population is still in a diminished state but we’ve learned a lot about how to improve the health of the hives and, as a result, the number of bees has been steadily improving. 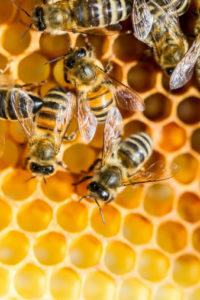 It is now believed that Colony Collapse Disorder is most likely the result of multiple factors: Varroa mites, other pests and diseases, lack of genetic diversity due to shortsighted breeding practices, pesticide exposure, and lack of adequate nutrition and forage. Along with many others, the Almond Board of California has been focussing on figuring out what to do about each of these factors. And while the problem of bee health has not been completely solved, things have improved to the point that Colony Collapse Disorder (CCD) has almost completely disappeared! Very few, if any, credible cases of CCD have been reported in five years. Hooray! It’s always great to be able to report on how the concerted efforts of a lot of different committed people can turn the tide and bring needed change to our world.